On the long weekend 18–22 March we had a Nordic Order retreat at Abhayaloka retreatcenter, in Finland. This time only eight of us gathered, four from Sweden, three from Finland and Vaddhaka from Tallinn. We had a very good time, enjoying each others company, tuning into each others lives, meditating (of course), seeing the video of Maitreyabandhu (se previous entry) as well as one of Bodhiketu – both of which we relished and discussed and pondered afterwards. The winter weather persisted outdoors, but indoors spirits were very good. 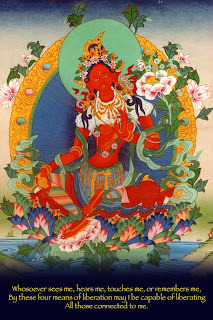 In the last puja Liladhi led the Red Tara mantra, with a beautiful tibetan tune. 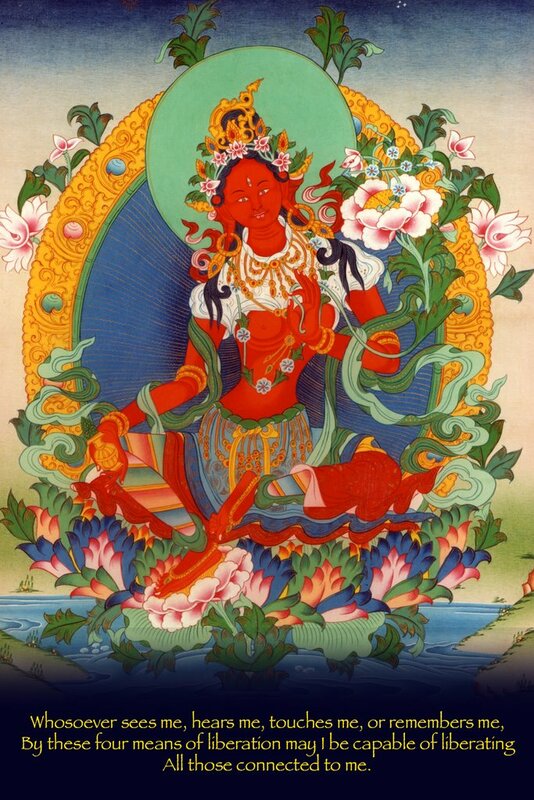 I found the image to the left googling on Red Tara images. I was really taken by it and that she is red. Of course Tara is mostly green but there are many forms of her. Apart from the programme I also translated an article that Liladhi had written about her work as a hospital clown, which is going to be published in the Swedish buddhist magazine Buddhism-nu, which I enjoyed doing and checking with her that I had understood everything. It's a fascinating read and an good example of Dharma work in the wider world. I hope it can be made available in English too, somehow. Tomorrow I'm off on a retreat with Subhuti at Padmaloka, which will be interesting and I'm sure inspiring and invigorating to my Dharma practise.